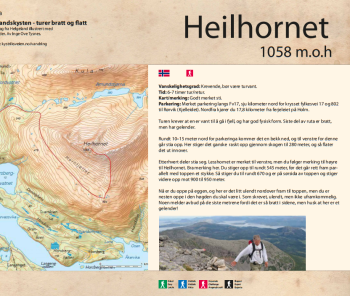 Heilhornet is Southern Helgeland’s highest mountain and is located in Bindal municipality. The route is well marked from the parking area north of Kjelleidet, and takes about 5 to 7 hours at a moderate pace. The route is for experienced hikers with some steep/airy sections towards the peak. The trail to the very top is 12 km long and takes aprox. 5-7 hours in moderate tempo. The staring point is from the parking place along route 17 (Kystriksveien) and there are roadsigns pointing to the parking. You should be fit and wear good shoes! Difficulty: Demanding. This is not a trip for small children or people with no hiking experience. Take highway FV17 in Bindal municipality and stop at the rest area at Hornelva River. The rest area is located about 100 metres south of Lysfjordvatnet Lake (92 metres above sea level). The trail goes up a wooded hillside to the left of Hornelva River. After passing some small marsh areas, we come to a small lake. This is a nice spot to have a rest before moving along, as well as a nice place to swim on the return trip if the weather and temperature permit this. We veer southward from the lake and follow the marked trail up and over to the next plateau. Our route extends 2 km southeast on the plateau along the “foot” of the Heilhornet Mountain at an elevation of 500-600 feet. We follow the edge west a few hundred metres to the peak. The edge is relatively easy to walk, but can be challenging for people dealing with fear of heights. The trip is demanding for children and also requires sure-footed dog paws.